I've missed this linky for the past couple of weeks despite doing lots of cooking with Miss T (just didn't get time to blog about it) so I am determined to join in this week. You might remember from a few weeks ago that Miss T has been doing some cookery sessions at our local Children's Centre. So I thought I'd blog about some of the recipes she's been making there; Tuna Pasta Bake and Spring Rolls. Next mix the peppers together just for fun because you love anything that involves mixing! Add some cooked pasta to the bowl, along with some tuna, and sweetcorn. Add some passata and mix well. Put the mix into an ovenproof dish and sprinkle with some grated cheese. Bake in the oven for 15 minutes at 200C. I had never before made spring rolls so I found this more exciting than Miss T. I was so excited that I forgot to take any photos during our cooking session so when we took the spring rolls home to finish off in the oven and then eat - I seized the opportunity for photos! 1. Fry the pepper, carrot, beansprouts and onions in a little oil. Stir-fry for a few minutes then add coriander and soy sauce. 2. Using a pastry brush, brush the pastry sheet (spring roll wrapper) with the oil. 3. Place the stir-fried vegetables onto the pastry sheet, then diagonally wrap the corner of the pastry sheet over the vegetables and tuck it under the veg. Then tuck in the sides and roll up to make a spring roll. 4. Bake in the oven at 200C for 15 minutes. I've been desperate to make these again but can't seem to find the Spring Roll pastry wrappers anywhere. Miss T at 25 and a half months! Despite her previous love of bubble wrap, she now finds that 'scary' too. She has lots of new words daily and yet a lot of her words sound similar. Purple shoes and apple juice being particularly hard to distinguish! And 'bubbles' sounds similar to apple and purple too! She loves eating avocado and is still a big fan of chocolate. When the boys are at their drama and youth clubs, daddy will often take Miss T to visit granny and grandad and their dog who she has named 'grandog' (real name Holly). She has started to call her visits there 'dog club' as it is whilst the boys are at their clubs so this is like her club. Since I took her swimming last week, she keeps asking for 'plash gain' (splash again) as she loves swimming and loves bathtime too. We've enjoyed going bowling over half term and a trip to the lake to see the geese. It is so great that she can join in with these activities this year rather than just sitting and watching from her buggy like this time last year. She is TOTALLY Poppet obsessed asking to wear her poppet dress daily. She also asks to do 'poppet iPad' meaning Moshi Village on the iPad. 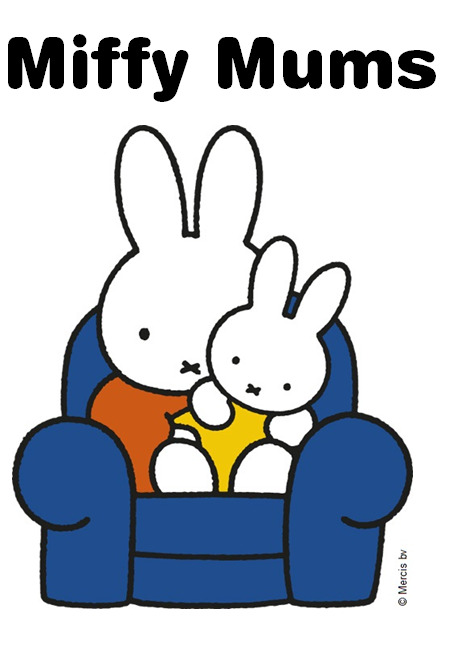 If you ask what her favourite word is she will say 'poppet', second fave 'uma' (katsuma) and then 'buh-ter' (Buster i.e. Buster Bumblechops). And J says about Miss T: "She's the best thing in the world!" 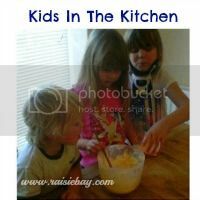 Linking up with Kid's in the Kitchen - You can link up recipes, new or old, or anything about Kids cooking in the kitchen over at Raisie Bay. To celebrate today's launch of Mario Kart 8, we wanted to share with you this song from The Brett Domino Trio called 'Blue Shell Blues'. If like me you weren't too sure what being 'blue shelled' meant, once you watch the video, you will soon figure it out. 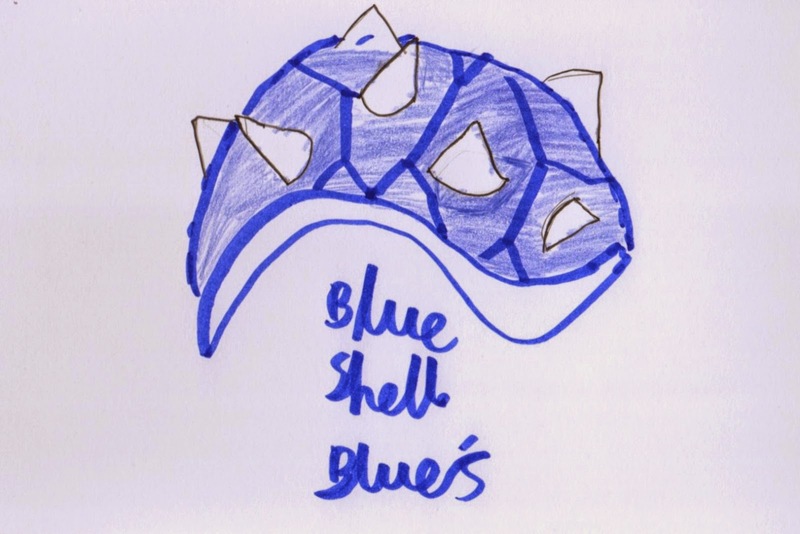 Unsurprisingly, the kids knew exactly what #BlueShelled meant as they are the biggest Mario Kart fans in our household. And so did daddy: "It's very annoying - getting Blue Shelled happens when you least expect it - when you are in the lead and you end up at the back!" One of my sons (he didn't want to be identified) immediately said that when his trousers split at school and he was highly embarrassed in front of the class - that was definitely a #BlueShelled moment. J said that after getting 10/10 for Boys Brigade inspection every week, he was #BlueShelled when he had ink on his hands from a Boys Brigade activity that wouldn't wash off in time for inspection and so for the first time didn't get 10 out of ten. Both boys agreed that having mushrooms (real mushrooms - not the Nintendo kind) in meals meant they'd been #BlueShelled as they hate mushrooms! Mummy's been #BlueShelled when there's lot of blogging and tweeting to catch up on and the internet broadband goes down for the day. Daddy's blue shell moment is when he teaches the kids a new game to play and by the next day they are better than him at it. Even Miss T was #BlueShelled a few days ago when she turned on the TV to watch Justin (Something Special) and found the TV started to burn and couldn't be fixed. We'd love to hear of any Blue Shell moments you've had recently. Do leave a comment to tell us. Disclosure: We have not received any compensation to share this video but as Nintendo family bloggers we are happy to do so. We will be taking part in some fun challenges in the coming weeks to celebrate the release of Mario Kart 8 so look out for how we get on with those! 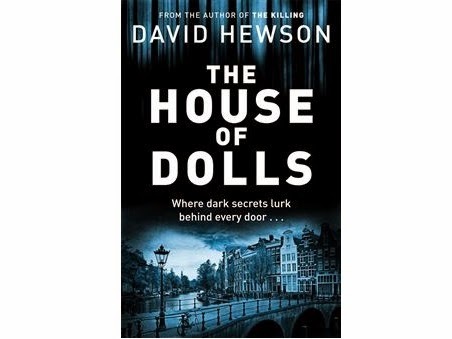 The House of Dolls is the new atmospheric crime thriller from David Hewson, author of The Killing. Three years ago, the 16-year old daughter of detective Pieter Vos went missing. Despite their best efforts at the time, the police never found her body. It broke Vos, tore his family apart, led to him leaving the force, and turned his life upside down. Now, three years on, another young girl has gone missing in strikingly similar circumstances. Vos is dragged back in and coerced into rejoining his former colleagues in trying to solve the mystery. Partnered with a young probationer, Vos must reflect as much on his own life and that of his now ex-wife, as on the people that surround him. Delving into the dark and secretive world of the back streets of Amsterdam, Vos starts to piece together the clues. But what will he find? As with The Killing, David Hewson has pulled together a mix of both the political elite and the grimy underclass. The clues are scattered through the novel in a stylish and sophisticated way, although I failed miserably to solve them before all was revealed in the closing pages. This is a fast-paced, brilliantly-written book, definitely hard to put down, and well worth picking up. The House of Dolls, by David Hewson is published by Pan Macmillan and available to purchase from their website. You may remember from last week that I am taking part in a challenge with Aviva and Mumsnet with the aim of reducing the stress in my life at the moment. You can find out more about the challenge and the personalised tips I received for week 1 here. So one week in, how have I been getting on? I really felt that Week One's tips were truly personalised for me and really rang true. I am always rushing around after others and never seem to get any 'me-time'. I used to think it was down to the homeschooling and I imagined that once both boys were back at school then it would be easier to carve out that precious 'me time'. That has not been the case at all though. Perhaps because Miss T is at an age where she needs constant 'entertaining' and it almost feels like she is more demanding because the boys aren't around during the day. Before just having them at home used to mean that they were her entertainment, even when they were busy working hard on their homeschooling, they were still around and she seemed more content. Now she will say 'mummy sit' 'mummy play' as I think she's noticed that I am always on the go and always have jobs to be getting on with. So now I have that constant guilt about needing to get things done and wanting to spend quality time with Miss T too. With the exception of this evening when I am typing this up late at night, I have been spending a lot less time online in the evenings. This has made a difference in helping me to 'wind down' ready for bed and to be honest it has felt like a treat to be able to just relax in front of the telly in the evenings instead of trying to keep on top of emails and 'blogmin' (blog admin). At one time, my 'me time' to relax was getting on the computer and reading and writing blogposts - at the moment it feels like I need to do that less as it is impacting on my sleep and quality of family time. Again it is getting the balance right because the blog was supposed to be a way of capturing memories of the kids whilst they are young and yet when it becomes a chore to keep it updated and leads to late nights and lack of sleep, then it actually has a detrimental effect on family life rather than the positive effect it was intended to have. I think I am going to have to accept that a hobby such as blogging should be just that, a hobby. And a hobby is supposed to be something you do in your spare time which I don't really have much of at the moment. So a bit of a blogging break or reducing the amount of blogging time (certainly in the evenings) would be a good start. I try not to turn the computer on during the day so that it doesn't affect my time with the kids, but perhaps Miss T's naptime would be a good time to catch up online instead of in the evenings. “You mentioned that you have some big decisions to make. Set a specific time and date with your husband to make these decisions. Be really clear what the time is for and the objective of the meeting - the decision you both need to make. It sounds very 'business like' however by allocating this time allows you and your husband to concentrate on other things that need doing, allows you both to prepare for what you need to talk about and having a clear objective ensures a decision is made. This can be applied to other aspects of your life too”. “Think positively and list 1 or 2 things you did well today or that you're grateful for. Perhaps this is something which you could do as a family. Doing this makes you reflect on your successes and makes you feel more positive especially at difficult times. You could even put your 'successes' into a jar and use as a pick me up when you're feeling low”. Fitness from England rugby players Billy Twelvetrees and Jonny May and former Captain Mike Tindall. “Swimming is a great form of exercise as well as relaxing - if you can get to the adult only sessions! Go swimming as part of your 'you time' and kill two birds with one stone. Even if you manage half an hour doing the breast stroke you can burn 367 kcal, whilst a fast front crawl burns a whopping 404 calories!”. “If you can't fit time in to swim then try cleanercise! Think of cleaning as your exercise . Did you know that hoovering for 12 mins burns 50 calories, whilst ironing for 33 minutes burns 100 calories? If you had a full hour, gardening burns up 360 and washing and waxing a car is 300 calories. These are all small steps to help you reach your target weight but hopefully manageable within your schedule. “Eat for sleep. A dinner heavy in carbohydrates can cause a slump in your blood sugar levels after eating which in turn will then turn on the stress response, which may affect the quality of your sleep and wake you up. Because you're having trouble sleeping have food that’s protein and vegetable rich so it stabilises your blood sugar levels for a better night's sleep”. The objective of the Stress Less challenge is to arm me with personalised expert advice with the aim of committing to at least one for a lifetime - To make small changes for a long-term benefit to help reduce or help me be better prepared to deal with stress. Week 2 tips sound good, but in practice, with my long-term arthritis and back-pain even swimming and housework are no-no's if I'm having a bad week pain-wise. I think it is going to be a case of trying to do these things when my back / hip are feeling up to it but taking care not to push myself on the days when the pain is really bad. It has made me realise that we might need to find a childcare solution in the longer term to allow me to have sessions at the hydro-therapy pool which has helped in the past. So it might be a case of looking at whether finances would stretch for a day at nursery for Miss T so that we are not relying on friends and family to help out on an ongoing basis. From the tips I have been given so far, I feel the one that would be most beneficial is from Week 1 and the importance of making some 'me time'. This is something that has come up again and again in my life as I never put myself first and I need to recognise that I'm not going to be at my best for looking after the rest of the family unless I look after myself properly. Find out how I get on with Week 2's tips next week and which change I'll be committing to for life. Disclosure: I am a member of the Mumsnet Bloggers Network Research Panel, a group of parent bloggers who have volunteered to review products, services, events and brands for Mumsnet. I have not paid for the product or to attend an event. I have editorial control and retain full editorial integrity. I will receive a small incentive upon completion of the Stress Less challenge for blogging about my experience. When the lovely people at Nintendo asked us to try to create a Mii on the Nintendo 2DS, I asked my little helper (D) to give me a hand in creating a mini-Mii of me! It turned out that Blue Bear also wanted to help, but he found the stylus a little tricky to hold so it was back to D as the master artist. There are two ways to create a Mii, so we started off by creating one from scratch. You get to select the height and 'girth' of the Mii, along with the overall face shape and then each part of the face in turn. Eye colour and shape, eyebrow colour, shape and position, nose shape, mouth shape, hair - you name it, every facial feature is yours to sculpt. After just a few minutes, D had created the Daddy Mii and gave him a name and favourite colour. D was very keen to try other way to create a Mii - using the 2DS to take a photo. Once the photo was taken, a basic Mii is built for you. The 2DS gives a number of faces to choose from, and you can then edit every feature separately if you want to. We didn't, and D simply chose the face that he thought looked most like daddy, saved it and set him free to mingle with the first Daddy Mii. Creating a Mii was very simple and good fun. D now has plans to create a Mii for each member of the family. Disclosure: As Nintendo Family Bloggers, Nintendo have kindly sent us a 2DS for the purposes of review. Well what a roller coaster of emotions this book took me on...feeling the excitement of what lay ahead of the 1924 Everest expedition team, the frustrations of the long journey before they could even get started on the climb, the loneliness and bravery of Ruth and the Mallory children left behind to wait and hope and trust, only to be devastated by the tragic ending. In the past, I have found that I have enjoyed reading novels based on historic events like Victoria Hislop's The Island which is set in the Greek island of Spinalonga, off the coast of Crete, at the time it was used as a leper colony. I also really enjoyed Hislop's The Thread, again looking at historical events in Thessaloniki through the lives of fictional characters. And so I found that I also enjoyed Above All Things. But this time it was different knowing that the characters were based on real people. Specific individuals whose tragic fate is all too known with George Mallory and Sandy Irvine never returning from their attempt to be the first to reach the summit of Everest. But the book was just the beginning. After finishing the book. I kept wanting to pick it up again, to read more, to find out more about how Ruth and the children were coping. To read again of what must have been some of the most breathtaking views on the planet. To try to better understand that balance between wisdom, passion and the 'driven-ness' of wanting to be the first to conquer Everest. At the end of the book the author explains a little more behind the fascination with the George Mallory story and the research that went into the book. And it left me wanting to see for myself who these people were, what they looked like in their mountain climbing clothing of the time, and what the thinking was about whether they did actually reach the summit. I found myself randomly doing google searches, seeing photos of Everest, seeing photos of the 1924 team, finding details of lives lost on that mountain. Lacking the time to be organised I didn't keep a list of sources or links but some of the fascinating things I found from my google searches blurred into my mind intertwining with the story I had just finished reading. I found it interesting that despite the perils of the mountain and the tragic loss of Mallory and Irvine, both Mallory's grandson and the grandson of Somerville followed in their grandfathers' footsteps climbing Everest many years later. It was also incredible to read about how when Mallorys body was found in 1999, that despite many of his belongings such as receipts and notes on oxygen cylinders had been preserved, the photo of Ruth that he'd promised to leave on the summit wasn't on him, leading to further speculation that he had indeed reached the summit. I found my mind desperately trying to make sense of just why they carried on that day despite being behind on their own timings which they had wanted to stick to which would have helped them abort the mission and return in time to not be caught out by nightfall. And then I came across this piece which explains 'summit fever' really well and along with the photos helped me to understand that George Mallory would not have wanted to turn back at that point. It seems, even today, that summit fever is still an ever present danger with many dying on the slopes of Everest by being caught out by that deceptively close summit when in the final stages of their climb. This story is far from being only relevant to the past as it fascinates and captures the imagination even now. Recent events inspired by the 1924 expedition include tests being conducted in replica clothing to see if Mallory's and Irvine's clothing would have been up to the job of getting them up Everest. And a relatively recent film (2010) made about the 1924 attempt - Only weeks after the film being made, Natasha Richardson who had played the voice of Ruth, was killed in a skiing accident. A tragic and stark reminder of just how dangerous mountains are. There also remains the possibility of history being re-written if the camera they were carrying is ever found. Thought to be with the body of Sandy Irvine, it could contain clues about summit success or otherwise. Leaving the story still unended and without full closure. As I've found myself pondering Above All Things over the past few weeks since finishing the book, I flit between wondering how they could have let themselves be caught out by the mountain and pay the ultimate price out there. Surely they cared more about their families and loved ones than about the mountain. Then a moment later, I find myself understanding their decision not to turn back - to want something so desperately that they lose sight of the bigger picture. To want something so much and for so many - they must have felt an immense pressure on them particularly in light of a failed 1921 attempt, the difficulties of the war years and Everest being considered the third pole. So why was it not enough for them? They'd already achieved new height records. The world of science and exploration already had a lot to thank them for. Why push to the limit? Why pay the ultimate price? Why not put safety ahead of success and be satisfied with returning home to family? Perhaps we all have Everests of our own. Ok so they may not be as high profile or as spectacular. Perhaps we are not faced with having to pay the ultimate price. But it did make me think whether we are all guilty at times of wanting something so much, of losing perspective, of putting things ahead of our families that really we shouldn't do. I am thankful to the book for reminding me of that. For reminding me of what I have and what I treasure most and to remember to put my loved ones first 'Above All Things'. Read other reviews of Above All Things on the Britmums Bookclub linky here. Disclosure: As a member of Britmums bookclub, I received a copy of the book for the purposes of review. All opinions are my own. 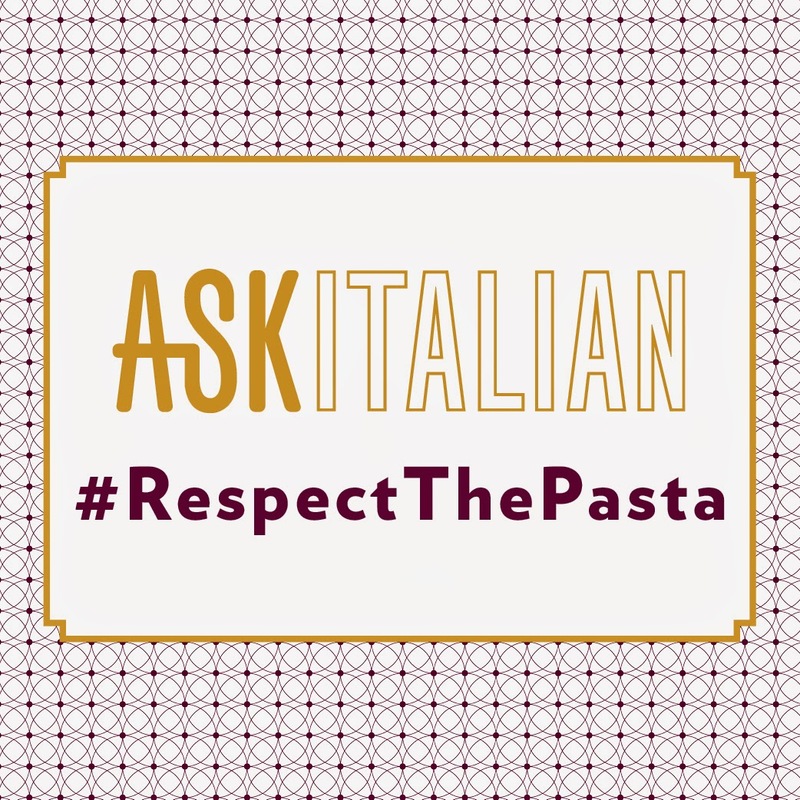 Those of you following the challenges we've been doing with ASK Italian will know that ASK Italian are on a mission to get people to #RespectThePasta by giving pasta the respect it deserves. We kicked off with a fantastic meal out at ASK Italian to Respect the cook, followed by our second challenge which was 'Doing it right' where we prepared a pasta dish following Theo Randall's Pasta Rules. The third challenge was 'Re-respecting the Pasta' where we recreated the "Fettuccine Con Verdure" recipe from the ASK Italian Cookbook. Challenge four involved making ravioli from scratch and now here we are for the last of our challenges with Challenge 5: Creative and Kids. 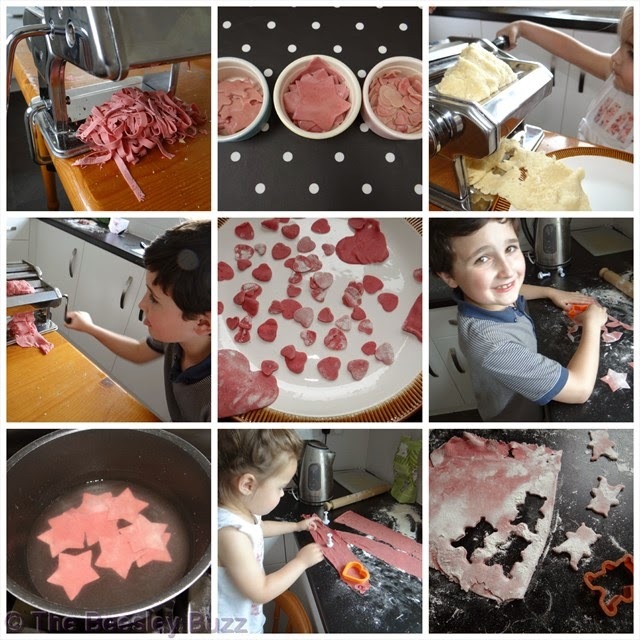 As pasta has become a huge focus in our lives over the past few weeks we wanted to end the #RespectThePasta blogposts with a grand finale where we have got the kids involved in not one, not two, but a whopping 3 pasta projects! One of the most interesting facts we discovered as part of the challenges is that there are over 600 different types of pasta and we want to pay homage to this fact in our final challenge. So we used lots of different types of pasta in our 'art and craft' project with the kids making some pasta art. We used spaghetti, penne, tortiglioni, macaroni, fusilli and farefalle. This is so simple to do but looks really impressive! Finally stick the heart onto your canvas to finish your 'pasta art'. 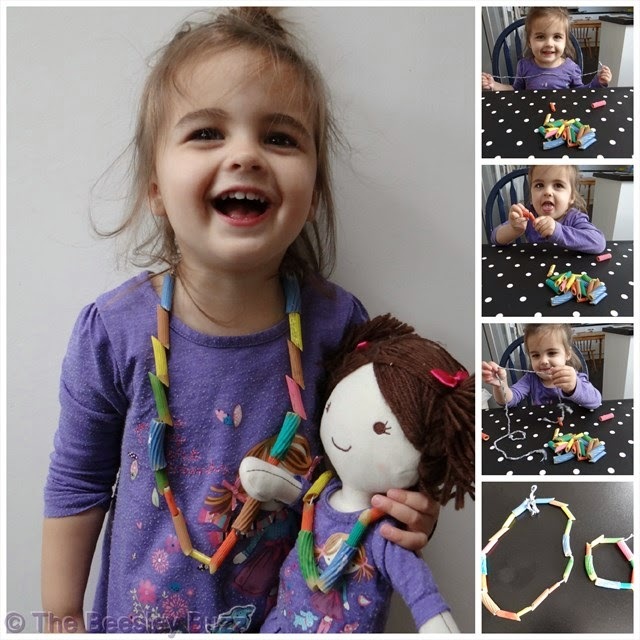 Miss T didn't want to miss out on the fun so she got to paint some different types of pasta in different colours and then practiced her threading skills making a necklace for herself and for her doll Milly. But we couldn't finish without eating some pasta for our final challenge too. We love the fact that the #RespectThePasta campaign is all about reminding people just how amazing pasta is. What better way to celebrate than to create our very own types of pasta to add to the list of 600 existing types of pasta out there. We enjoyed making our own pasta for our 'Respect from Scratch' challenge so we used the pasta recipe from the ASK Italian cookbook (see the recipe here), and let the kids get creative making their own pasta shapes. We also added some puréed beetroot to make our pasta even more exiting as it turns the pasta dough pink! Using cookie cutters, D made some star shaped pasta, J wanted teddy bear shaped pasta, and Miss T made hearts of all different sizes. For the smaller hearts she used an icing cutter. And as a big thank you to ASK Italian for the opportunity to be part of their amazing #RespectThePasta campaign, what better than making our very own #RespectThePasta pasta! The Challenge begins: Life is a combination of Magic and Pasta! Disclosure: We have been taking part in various blogger challenges set by ASK Italian as part of their #RespectThePasta campaign. All opinions are our own. 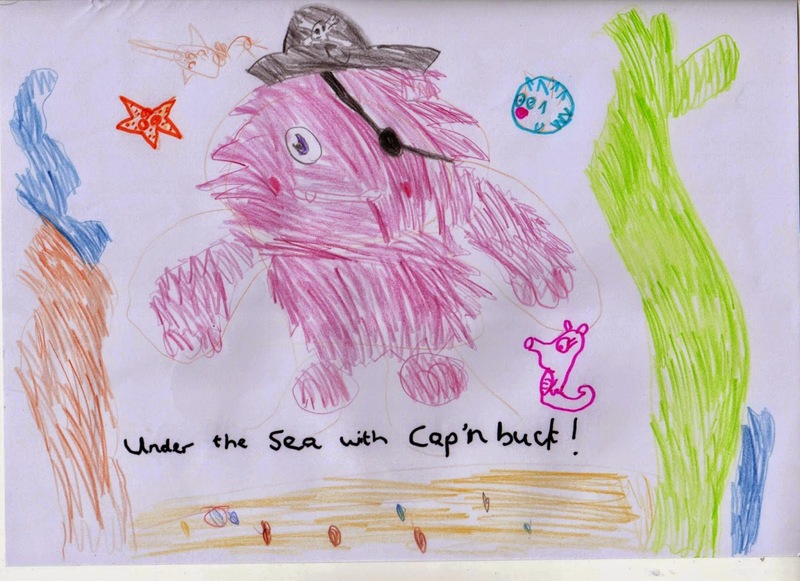 Another fantastic theme for This Mummy Loves' Draw With Me linky...This month it's Under The Sea. Arms covered in paint that wouldn't wash off for days! Awesome stencil art of a dolphin! Always busy, busy, busy, with no time to myself! I knew this was just what I needed when the opportunity came up to get some personalised advice from Aviva via their Less Stress challenge with Mumsnet. I've made a short video to explain just why this project came up at the perfect time for me. “Your stress levels are high and I'm concerned that this is spilling into the rest of your life. The worries at night stopping you from sleeping - feeling overwhelmed and the extra things in your life are worrying. You should consider seeing your GP and/or speaking to a stress counsellor. Schedule in some 'you time' and stick to it. You're rushing around doing things for everyone else that you need some time to yourself and start on the goals you want to achieve - weight loss. ‘You-time’ also helps to put the day into perspective”. “There is research that shows foods that are green or red helps elevate mood - so beets, carrots, blueberries, berries, spinach, broccoli for example. If we get our daily requirement of vitamins and minerals it helps our ‘feel good’ disposition, as we are more likely to have supported our immune system”. I can't emphasise just how 'spot on' these tips have been for me. I had filled in a questionnaire about how I was feeling at the moment, but both Dr Doug and Paddy seem to have read between the lines too and really picked out key things that I have been battling with for a long time like the need for 'me time'. I am so grateful for these tips on Worklife balance, wellbeing and diet and I will be putting them into practice and letting you know how I get on soon! When the lovely people at Pan Macmillan sent me a preview copy of this book, I was very excited! I love a good detective story, and this tale does not disappoint. First published in Norwegian in 2010 and now translated into English for publication in 2014, The Human Flies by Hans Olav Lahlum is the first in a series of books featuring Detective Inspector Kolbjorn Kristiansen. Known as K2, Kristiansen finds himself in charge of a murder investigation when the body of Harald Olesen, a hero of the Resistance, is found dead in his apartment. It quickly becomes clear that the murderer must have been one of his neighbours, but they all seem to have dark tales and secrets from their pasts to hide. Set in 1968, this book explores the intertwined histories of the neighbours, with the motive for the murder somehow linked to the war and Olesen's involvement in it. K2 is assisted by the most unlikely of helpers called Patricia, who has gleaned her knowledge of crime fighting through studying historical tales and the works of Agatha Christie. Initially I found his precocious assistant incredibly annoying and frustrating - she was always several steps ahead of him (and us!) and seemed to enjoy talking down to him. But, as the potential suspects become less likeable and generally more suspicious, Patricia becomes more likeable, more genuine and more human. Carefully detailing K2's investigation day by day, I found this book very hard to put down. As the investigation gradually closes in, K2 and Patricia find themselves in genuine danger and the end of the book is hard to predict. I was very pleased with myself to have correctly identified the murderer half a chapter before K2 did, but then realised that I had thought it was each one of Olesen's neighbours at some point! This book is a must read, and really keeps you on your toes. I'm really looking forward to the next installment in the series. The Human Flies, by Hans Olav Lahlum and translated from the Norwegian by Kari Dickson, is published in the UK by Pan Macmillan and available to purchase from their website. Betta Living have challenged bloggers to come up with a recipe for National Vegetarian Week which runs from 19th-25th May this year. Although we are not vegetarians ourselves, we do try to have a meat-free day or two each week. We recently visited the Sealife Centre and heard about just how much deforestation is caused by raising livestock for meat. We found out that shockingly 'At the current rate of deforestation, there will be no rainforest left by 2060!'. Reducing our meat consumption and only buying British meat can help so that's what we are trying to do. Other fantastic benefits of eating vegetarian meals are that they are often packed full of tasty, healthy veg and cost less too as they don't contain meat. This recipe I have created for Mushroom Beanballs and Cumin Veg Rice contains loads of colourful vegetables and is nutritionally balanced and works out low in cost too! The ingredients list might look long - but a lot of it is storecupboard ingredients you'll have at home. And when it comes to that lovely veg, feel free to substitute with any other veg you have in your fridge - almost anything works! 1. Finely chop half a red onion and 2 cloves of garlic and saute in a frying pan in a little rapeseed oil. Then slice the mushrooms and add them to the pan, followed by a teaspoon of dried parsley. Once softened turn off the heat and leave to cool a little. 2. Drain and rinse the kidney beans. Using a fork or hand-blender mash the kidney beans. Add a drizzle of rapeseed oil. Add a teaspoon of ground cumin (you can simply crush the cumin seeds with a pestle and mortar to make ground cumin) and a teaspoon of dried coriander, followed by the juice of a lemon. Mix together. 3. Blitz the bread into breadcrumbs using the chopper attachment of the handblender. Then add the breadcrumbs into the kidney bean mixture. 4. Then add your sauteed mushroom mixture into the kidney bean mixture and mix to combine. Now shape the mixture into some little balls and lightly fry in a frying pan or griddle pan. These quantities were enough to make 18 bean balls. 5. Cook some rice according to pack instructions. I cook mine in the microwave by covering with some boiled water and cooking on high power for 20 minutes. Even though it is normal rice (not microwave rice) it gives perfect results! 6. Whilst the rice is cooking, chop the veg into pieces. Keep them chunky as this recipe really shows off the lovely colours of the vegetables! Also chop up the second half of the red onion. It will add an extra bit of colour. 7. Lightly fry the vegetables in a pan, adding the drained and rinsed tin of chickpeas and a teaspoon of cumin seeds. Towards the end of cooking, add a handful of chopped fresh parsley. 8. Once the rice is cooked combine the rice with the colourful vegetables and serve with the mushroom bean balls. Whilst the beanballs might look like meatballs in appearance, they actually take on the taste of the garlic, spices and lemon and taste amazing! They would however, easily rival meat in terms of protein content because the kidney beans and mushrooms are packed full of protein. A colourful dish for all the family to enjoy during National Vegetarian Week. Why not make it as a meat-free meal every week! 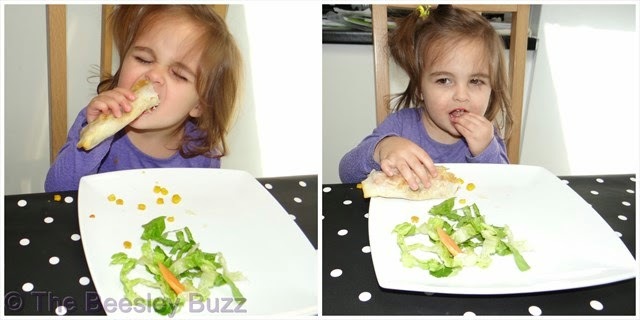 This is my #BettaRecipe vegetarian recipe entry into Betta Living's blogger competition. Find out more details here. The Final Weekend of the Nectar Savvy family challenge! I can't believe that it was nearly 6 weeks ago that we wrote about our excitement about being picked as one of 8 finalists in Nectar's search for the savviest family. We've been blogging over at Nectar Savvy over these past 6 weeks, and here we are with our final weekend of the challenge. 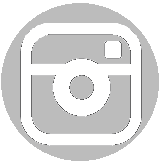 We would love it if anyone reading this could pop over to any of the recent blogposts and leave a comment there instead of here. It's been a really intensive 6 weeks and as we blog as a hobby usually we've not been used to writing so many blogposts each week - I totally take my hat off to bloggers who blog daily! I don't think I've ever worked harder on anything in my life! What we would really love is for some of the things that we are really passionate about to impact anyone who reads those posts. Yes it is great to be savvy and save a few pounds here and there but if you can extend that savviness to help others, then that's what makes it truly worthwhile. Whether it be helping favourite charities and causes, giving tips on creating sensory items for ASD/SPD, or simply encouraging others to have fun with the kids blowing big bubbles. Of course, we also have loads of lovely recipes if you look back to Sainsbury's Basics week, and lots of other tips on things like free days out, savvy savings on activities and hobbies, DIY tips and lots more! We are so thankful to all our lovely friends who have supported us with reading the blogposts and commenting over there over the past 6 weeks. It has really helped us knowing there are so many people reading and we really appreciate it soooo much - THANK YOU!!!! A weekend of food and fun!